WPL Industries BV manufactors a complete range of weighing indicators with high accurracy. Designed and manufactored in the Netherlands! Suitable for industrial use, as in the food, pharmaceutical and chemical industry. The R10 connects to one to three scales with analog strain gauge load cells. W&M approved resolution for C3 and C6 loadcells. Calibration is possible as single or multirange (e.g. 2 x 4000 d). 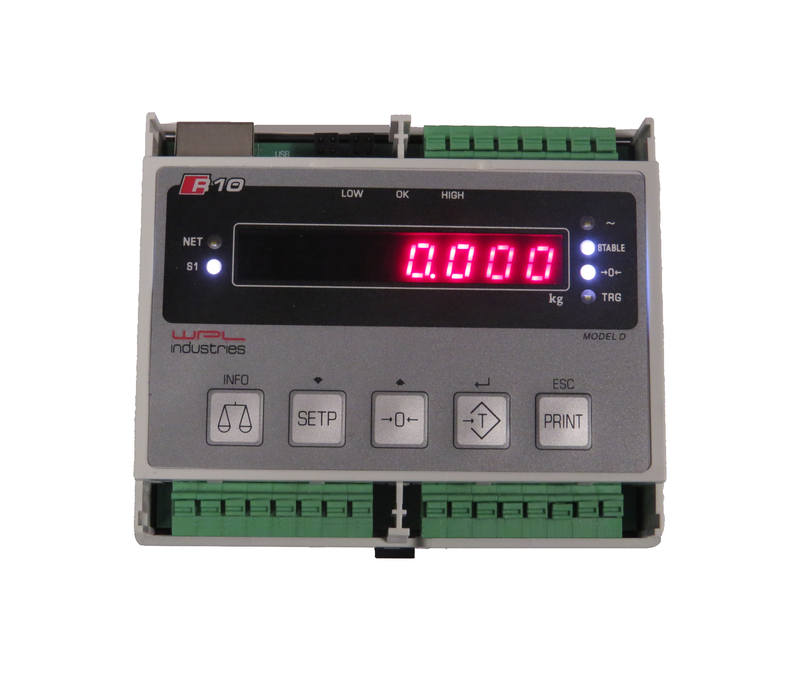 Interface modules for digital load cells are available as options. Display of net, tare and gross weight. Operator prompting with entry based on scipts. Weighing data can be stored in an internal W&M approved data archive. Optional board modules (shields) are available for various solutions. Via optional data logger. Printout of weights, totals, date, time, stored texts, entered IDs and calculated values. Transmission of all entered IDs, date, time and weight after each weighing cycle, data storage on the PC's hard disk or SSD. Via the USB interface. Reading of weight, taring, zero setting and other functions can be remotely controlled from a PC. Weights can be stored in a W&M approved data archive on the R10 or on the PC's for verification. Data transmission is possible through serial interface or Ethernet LAN. 7 segment white led display for indication of weight and operator prompts and calibration. Sealed membrane keyboard with tactile feedback, general keys for the input of tare weights and additional information, scale keys for zero setting and taring and function keys. With the build-in relais two weight thresholds can be monitored, e.g. for max. or min. values. Start of weighing cycle and taring is possible from external switches. Alternatively the inputs and outputs can be used for a filling sequence with start/stop switch. • For connection to one or more load cells. • High quality construction in AISI 316 stainless steel. • Password protection for user and configuration changes.